We're on Day 2 of our "Meet the DT" part of CASology's big 100th Cue Card party! But you're the ones getting the gifts! The big reveal for this part of the prizes will be at our normal challenge time, Tuesday at 9 am EDT. 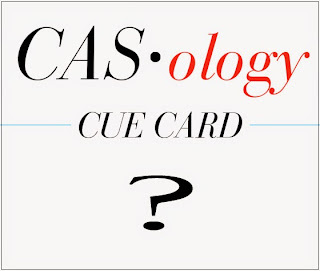 Also, each day, at 11 am EDT, one of the DT members will be featured at CASology (today is Kimberly). Once you've had a chance to get to know each designer better, head over to their personal blogs within 24 hours to leave a comment for a chance at some blog candy!